Wolltest Du schon immer nach Bali? Tempel sehen und an weißen Sandstränden liegen? Aus einer frischen Kokosnuss schlürfen und dabei bunten Vögeln zwischen den Palmen beim umherschwirren zusehen? Oder mit einem Fahrrad zwischen Reisterrassen entlang sausen und bunte Tempel besichtigen? Ich auch. Deswegen stand Bali unbedingt auf meiner Reiseliste. Leider habe ich es bisher noch nicht auf diese Insel geschafft. Bei unserer Weltreise mussten wir Bali aus Zeitgründen auslassen. Irgendwann. Das weiß ich. Irgendwann werde ich auf die Insel reisen und dann mit dem Fahrrad entlangsausen und und Reisterrassen besichtigen. Bali ist bekannt für sein Essen, seine Natur und seine Yoga-Retreats. Spätestens seit dem wunderbaren Buch „Eat, Pray, Love“ hat dieses Reiseland noch mehr Fans. Die Autorin beschreibt ihren Weg zu sich selbst in diesem Buch auf amüsante Weise. Erst isst sie sich durch Italien, dann betet sie sich durch Indien und dann verliebt sie sich in Bali. Am Ende wird Bali ihr zweites Zuhause. Wenn ihr Bilder von Bali googelt wird schnell klar warum. Wichtig ist auf Bali mittlerweile nur, wo man sich niederlässt. Es gibt überfüllte Partystrände und es gibt ruhige naturnahe Rückzugsorte. Bali gilt leider auch als das Mallorca der Australier. Da das Reiseland sehr günstig ist, zieht es auch Pauschaltouristen magisch an. Natürlich gibt es auf Bali noch viele Orte, die weder laut noch überfüllt sind. Einer dieser Orte soll das Puri Dajuma sein. Da wir Bali sehr spontan weglassen mussten, hatte ich im Vorfeld schon ein Eco-Hotel recherchiert, das unsere Herberge in Bali geworden werden sollte. Ich habe die Familie, die dieses Traumziel aufgebaut hat und betreibt um ein Interview gebeten. Falls ihr es vor mir nach Bali schafft, meldet euch und schreibt mir, wie euch das Puri Dajuma gefallen hat. Petra von Hollightly: Your place is right by the beach. Some people tend to say about Bali, that it became a very touristic place – do you provide a more calm and easy bali for your guests? 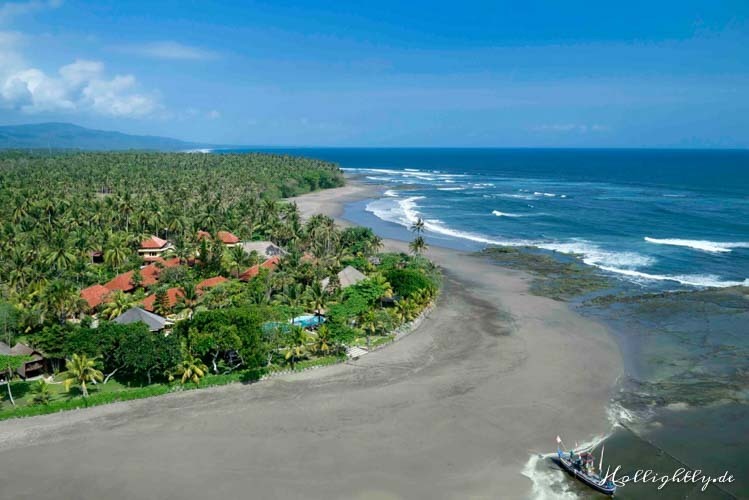 Louis Balme: Dajuma is built on a sandy cape, close to the famous surf spot of Medewi, 80 km from the airport and the crowdy beaches of the south of the island. On both side of the hotel, we have virgin beaches where our guests are used to stroll or swim everyday. Petra von Hollightly: What is important for you and your resort? Are there special offers you want to point out for our readers? 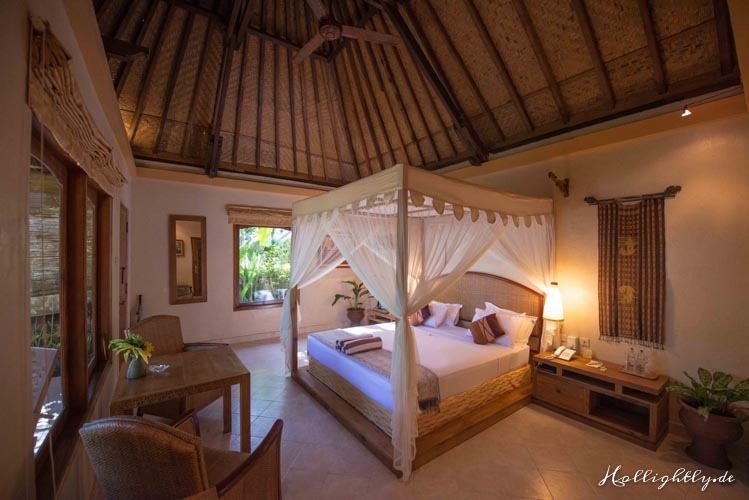 Louis Balme: We want to offer to our guests an authentic experience in terms of discovery of the unique Balinese culture. Dajuma is located in the small village of Pekutatan where muslim fishermen as well as hindu and christian farmers are sharing a peaceful life for centuries. This very special blend of cultures and religions reflects the spirit of Bali and its philosophy called Tri Hita Karena, which principles are harmony and balance from human to God, human to human and human to environment. We offer the possibility to our guests to discover this philosophy „in live“ by practicing every day social and spiritual activities with our staff and the villagers. Petra von Hollightly: Can you tell me more about the story of Puri Dajuma? Louis Balme: The story begins in 1998 with our family of French origin who fell under the spell of Indonesia. 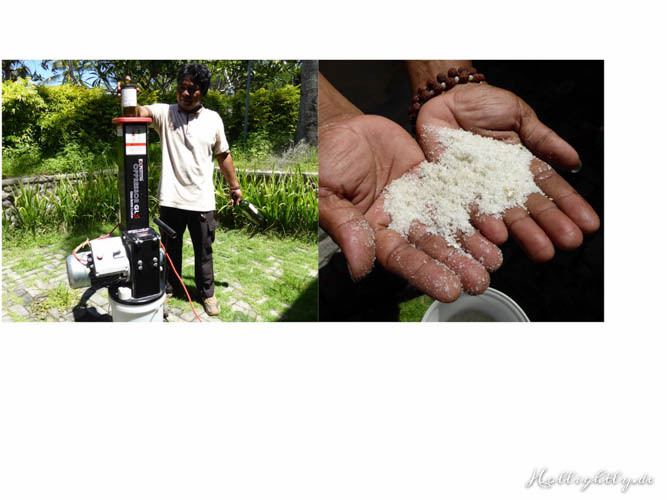 We met with Indra, a 24-year-old Balinese man in Lombok. Travellers and creative people at heart, we wanted to found a little charming hotel where family and friends gathered, and which could become a new common family goal. A family dream, long before being a business. The father took on board the overall design, the budgetary aspects and the technical coordination, while the mother undertook the overall and interior decoration, the touches of comfort and the harmony of the whole project. As for the children, they designed the website, researched for new ideas and dedicated themselves to discovering new recreational and outdoor activities, while the stepdaughters were involved in communication and advertising. Indra was in charge of recruiting staff and creating enthusiasm amongst the villagers so that they would feel part of the entire project. Petra von Hollightly: And how did you then find the spot where Puri Dajuma is now located? Louis Balme: The eldest of the children recalls: „From the famous temple of Rambut Siwi, together with Indra, I had spotted the only secluded headland on the western coast; a complete virgin cape, lined with immense beaches“. To reach it, he devised a 500-metre long track into the jungle, with a bridge spanning the river. The purchase of additional land was an opportunity to establish good relations with the neighbours who were delighted to soon have the use of the road as well. In this area only recently opened up to tourism, the authorities also favourably welcomed the project. From being a negotiator, Indra became a builder by overseeing the stages of- construction of the project which was designed in Europe: building a retaining wall on the beach, the road and the bridge. Then the hotel itself opened in 2002. Petra von Hollightly: I read that your cottages are traditional bali style – which means? Louis Balme: All our cottages are made from local materials combining bricks, wood and stone, respecting the rules and colors of Balinese architecture. For example, the roofs have the specific Balinese shape with these harmonious adornments in the corners and on the top. 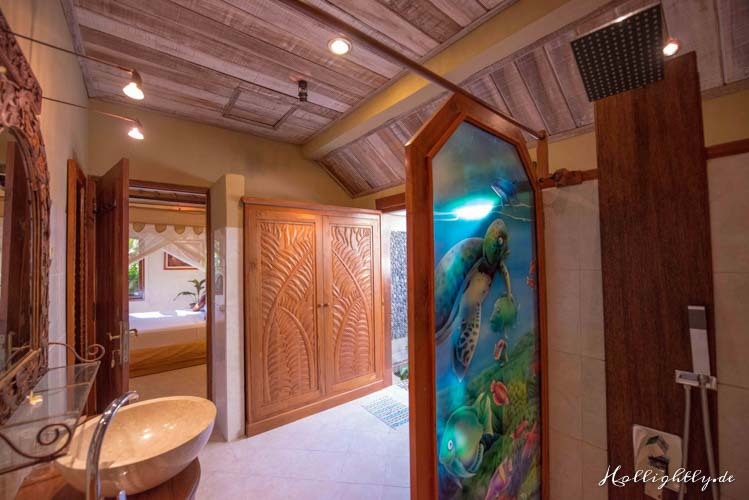 The doors and the windows are made from the teak wood with a specific carving showing a couple traditionally dressed, inspired from very old antiques. 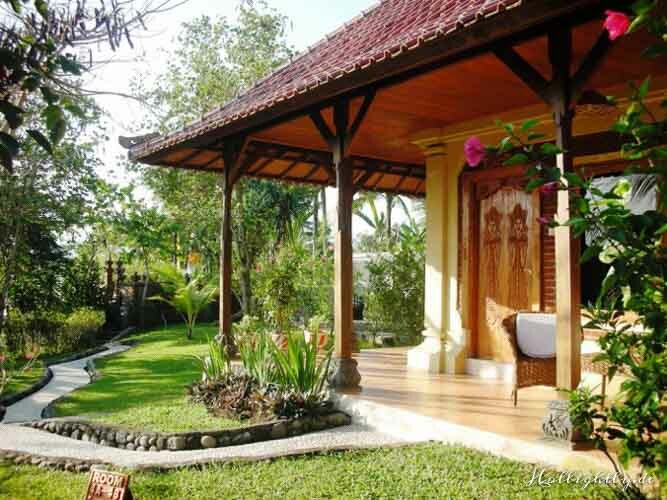 The pillars are also gently carved in the pure Balinese tradition. All the inside decoration and the furniture are also from Bali: nice paintings from Ubud, teak wood furniture, poster bed, outside shower so much appreciated by our guests. Petra von Hollightly: Lets talk about the hard facts  You are also an eco resort. 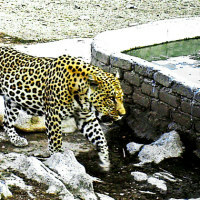 What are the ecological points aof Puri Dajuma? Louis Balme: Our family is very sensitive about environmental issues. We strongly share the famous sentence from St Exupery „We do not inherit the earth from our ancestors, we borrow it from our children“. It was just impossible to imagine starting this project in 2000 without limiting the impact of the hotel on its natural environment. We also wanted to develop it in respect of the 3 principles of Tri Hita Karena, especially as far as the social protection of our staff is concerned. Petra von Hollightly: Are there more to-Do’s on your ecological bucket List for the future? Projects or other points you want to work on in the near future? Louis Balme: The objective for 2015 is to create a compost area not far from the hotel at the disposal of the hotel and our neighbors. This is not an easy task because of the climate of Bali which is hot and humid and does not facilitate the chemical transformations necessary for making a good compost. Anyway we will do it! Petra von Hollightly: Just a last question. How ecological is the whole Island, bali, as a touristic spot? Louis Balme: Bali as a whole is more or less in the same status as our European countries, something like fifty years ago, as far as environmental personal behaviors are concerned. Which means that we still have too many plastic bags and other garbage thrown everywhere. But the positive thing is that it is rapidly changing: the pupils at school are trained to avoid throwing the garbage anywhere, the authorities start to collect the garbage in the villages and we are confident that the situation will quickly evolve and improve in the years to come. That’s anyway our best wish! Dieser Eintrag wurde veröffentlicht am #HollyGoesAroundTheWorld, A-Teil der neusten Artikel, Bali, Eco Spots, Green Travel, Länder. Setzte ein Lesezeichen permalink. Green Wedding: Öko-Brautzilla is calling!